My jewellery creations are made on a base of woven metals, some pieces also including precious or semi-precious stones, crystal, glass, or pearls. The metal weaves are built from many individual circles, linked together in a specific pattern for each weave. Many of the weaves have their origin in chain maille patterns of the middle ages, for example, the "European-Four" and "Half-Persian". The raw material for the weaves consists of either pre-made circles, for brass and nickel-plated metal, or plain wire for less brittle metals like copper, gold-fill, sterling silver, or niobium. These wires are first wound, and then cut, in order to create the needed circles. Each item of jewellery uses hundreds to thousands of the metal circles. Each circle must be individually linked to its neighbors, following the pattern of the specific weave being created. 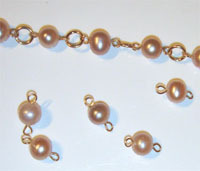 Stone, crystal, glass, and pearl beads are added as accent items to the metal weave by stringing them on metal wire. The wire used for stringing is curved into loops in order to link the bead into the metal weave.